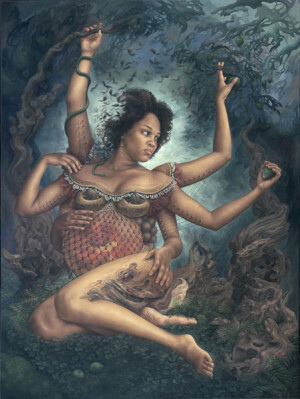 Heidi Taillefer may prove better than any other that different art can also be wonderful and noteworthy. In her works old and modern, supernal and demonic, mystic and mundane merge into one amazing wholeness. Everything together – we are not used to see that. H. Taillefer lives and works in Montreal, Canada. Her career started at the age of three, very soon she began to attend drawing classes. There she improved her art skills which were full of technological precision and bizarre elements found in biology. By her late teens she began to form a cynical view of humanity and it‘s impact on the world adopting vegetarianism and voicing criticism over mistreatment towards the animals and environment. Later she joined McGill University to get a degree in humanities which became useful in deepening the development of her art. In her works the artist carefully draws symbolical figures consisting of complex elements and adds modern classic details. She tries to keep the subjective experience of philosophy with absolute and calculable things combined with biological and technological elements. For example, the clockwork imagery acts as a language mirroring the ubiquity of technology in the world. This is an attempt to understand the primordial human nature and current mechanized world. Thus her work is an original creative fusion of classical figurative painting, surrealism, contemporary realism, and myhtology combined with popular figurative traditions. According to H. Taillefer, her work is addressed to our double nature: both to our dark and good sides. As individuals we can be our own worst enemies and the despair we occasionally or often feel only recoils in our own heads and hearts. The painful experience can hinder or help the individual – makes us either stranger or stronger. The higher consciousness recognizes that this is ultimately a choice, so we float up toward purity or sink down into darkness and pain only to be forced back into the cycle again. Today Taillefer‘s work depict philosophical thoughts about life which were inspired by personal experience. She examined the eternal questions of humanity, portraying technology growth despite the permanency of human nature. An artist draws attention to the new relationship between what is normal in a daily life and what is new and sometimes frightening. H. Taillefer art resembles some of the early 20th century surrealists such as Max Ernst, Giorgio de Chirico and Paul Delvaux. Taillefer‘s works are exhibited internationally in various galleries and museums.